Carter Leatherwork Rodeo Wristlet features a perfect combination of style and convenience. 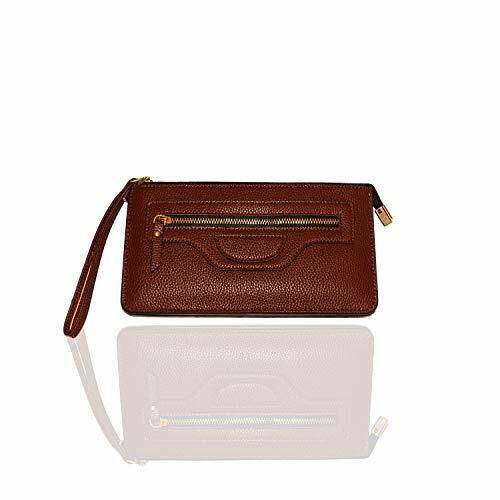 Carter Leatherwork Rodeo Wristlet Wallet Purse features a durable wrist strap, and a coin pocket with a stylish zipper on the outside which gives it its distinct look. The inside of the Rodeo Wallet Clutch features 8 credit card slots and 3 separate inner compartments that offer plenty of space to fit all your essentials. Carter Leatherworks Rodeo Wallet Wristlet Purse measures 8.5" x 4.5" x 1" which allows you to easily fit any size smartphone, while the durable outer zipper will securely contain your belongings inside at all times. Carter Leatherworks Rodeo Wristlet Clutch is made from PU Leather, which is a special highly durable type of faux leather, and is available in 7 distinct colors. Use of PU Vegan Leather ensures that no animals were harmed and no animal products were used to manufacture this wristlet. Measures 8.5" x 4.5" x 1"
If you have any questions about this product by Carter Leatherworks, contact us by completing and submitting the form below. If you are looking for a specif part number, please include it with your message.